Those who say that witchcraft isn’t real, better change your mindset. With the on going Xenophobic attacks South Africa by the natives to residents from foreign countries, a Malawian man recently took laws into his hand to protect his life and that of his family in one of the most bizarre incidents ever happened to humans. 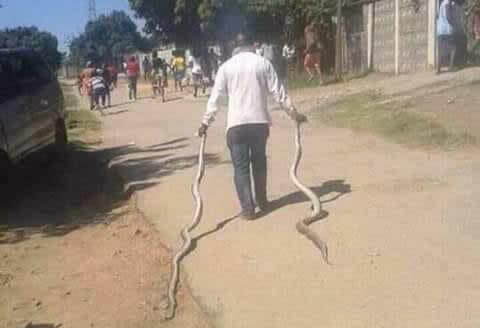 After being attacked at his house by two xenophobic South Africans who tried to burn his house in Durban, the yet to be identified Malawian man turned them into snakes, that left many revelers into shock. He then dragged them along the streets to the surprise of many including some of the attackers most of whom took to their heels upon realizing what had happened. According to revelers, there was at first a heated argument between the two men and the Malawian man that lasted for about 45 minutes, the two aggressive men then gingered terrible to get rid of the man and even to the extent of threatening to burn his hard earned house. This is where the diabolical Malawian displayed a very strange magic on them to turn them into snakes. 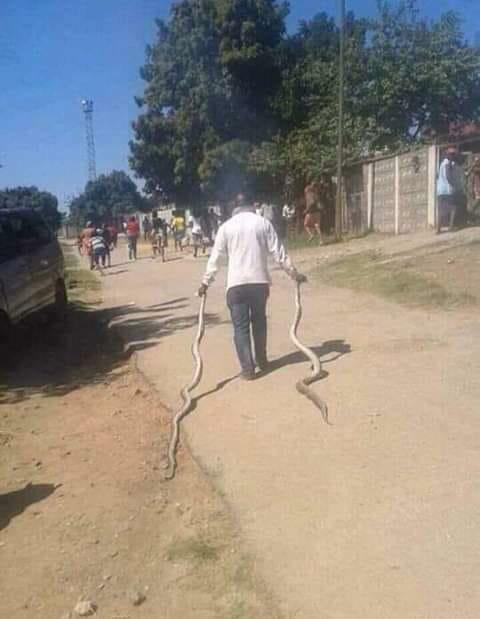 He is now demanding a compensation of R200,000 (approximately UGX 52.6 Millions) to change them back to humans and negotiations are still ongoing between the families of the snake-men and the Malawian man to resolve the matter. It should be noted that the South African government has been on the mute towards the xenophobic attacks done on foreign residents in the Soweto republic and this could be a good start to get their side.